Two homes on 4.78 acres both benefit from breathtaking views. Main home 4 beds 3 baths, second home 2 beds two full baths plus office. 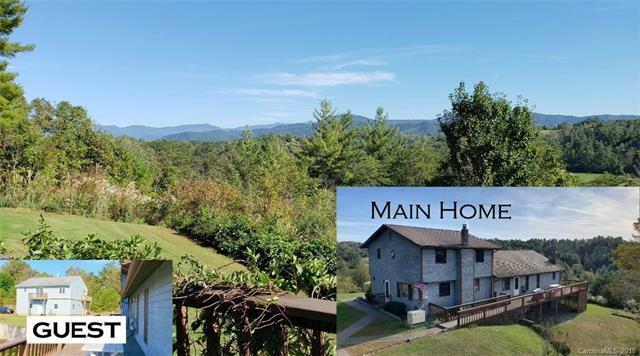 300 Trotters Lane is only a few minutes drive from the quaint college town of Mars Hill, and 15 minutes to Weaverville NC. This will suit those who like their privacy, and yet the ability to commute easily and reach all the modern conveniences. The main home is spacious and is built to take in the awesome views. The guest house is large and has a two car garage and workshop. The decor is original, bring your touches to make this a modern estate, or enjoy the warmth of before. The price for these two homes on this acreage, with these incredible views, takes this into account. The If you are looking for a full-time home that provides privacy, and yet in easy reach of highways etc, as well as a second home to rent for additional income, or have a guest house, this location would be a great fit.